Announcement Fusioned Family™ was founded on the principle that diversity should not only be embraced, but that it is necessary if we want to live in peace. 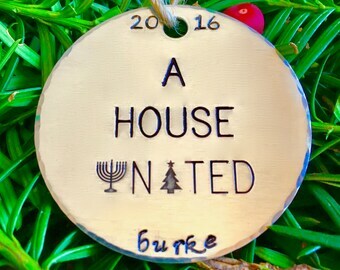 That is why Fusioned Family™ donates $1 to PeacePlayers International (PPI) for every ornament purchased. PPI brings Jewish and Palestinian children together to develop friendship and mutual respect, through the game of basketball. Fusioned Family™ was founded on the principle that diversity should not only be embraced, but that it is necessary if we want to live in peace. 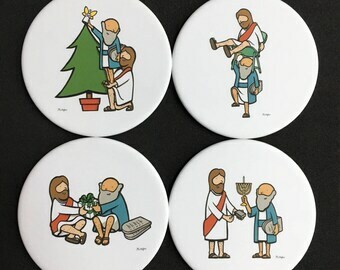 That is why Fusioned Family™ donates $1 to PeacePlayers International (PPI) for every ornament purchased. PPI brings Jewish and Palestinian children together to develop friendship and mutual respect, through the game of basketball. This is the 3rd ornament purchased and I always LOVE them! The item came on time and it was perfect! I Love You a Latke as seen in the wilderness of Anchorage, Alaska. Ever wonder what a Fusioned Family ornament looks like in Anchorage, AK when it's 15 degrees below zero? Photo cred to my friend of 20+ years. This is one of the original JC & Mo sketches. Now they have come to life in full color on greeting cards and gift wrap! Cutting a design with my saw in my workshop. Zeke doing the best he can to help out. My Bar Mitzvah! Also pictured are my sister, brother, and 2 first cousins. I got the idea for Fusioned Family when my friend invited me to spend Christmas Day with him and his family. I wanted to get them an ornament for their tree but I also wanted to give it a personal touch. I thought a Jewish Christmas ornament would be perfect. At this same moment, I realized our very own Christmas tree was not a complete portrayal of our family. While we love our lights, tinsel, and the embarrassing ornaments we made as children, there was something missing. We needed a decoration that would proudly display who we are. After searching everywhere, I found there were a few fusioned ornaments out there, but they were either mass-manufactured or poorly made (usually both). We pride ourselves on making unique holiday décor that allows fusioned families to celebrate the holidays in a fun and unifying way. I was born and raised in the Chicago area, but there is another city I also call home – I miss you every day, Cleveland, OH! I love to crossfit, go running with my dog, and eat large portions of food. I also substitute teach during the school year. Hello mates! This bio is best read in your finest English accent because I hail from Hull in the United Kingdom. I’m the illustrator at Fusioned Family and I got this gig because I’m dating Andy’s cousin. I love making custom pieces! Please message me prior to placing your order and I will work with you to make that "perfect something" for you. Custom orders generally will cost an additional $10 per item depending on the complexity. All ornaments come in their very own gift box filled with festive, colorful paper shred.